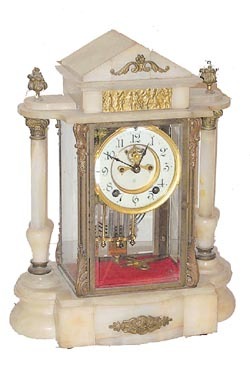 Ansonia Clock Co., crystal regulator with white onyx top, base, and columns, called the "Gonfalon", ca 1906. An 8 day clock, striking half hours on a cathedral gong, and is running and running. Porcelain dial is 2 piece with open escapement. 1 little flea bite at 1 o\'clock. Round movement, signed, rack and snail count. Imitation 2 jar mercury pendulum. 4 beveled glasses, all good. Brass frieze above the dial, 2 columns with brass capitals and bases, finials on top, ornaments top and base. 1 piece of onyx on top, behind the ornament, cracked in 2 places, and another on the right side of the base, above the metal post. Both can be repaired. Case is not real clean, doubt if it has ever been cleaned. Someone has added red felt cloth on the base. Ly-Ansonia No.409.